Welcome to the Week 11 edition of the 2018 fantasy football trade value chart, which helps you analyze potential trades to improve your fantasy football team. Our chart assigns a value to all relevant players — across all positions — to help you make the best trade possible. The week’s biggest faller in PPR leagues was Golden Tate. 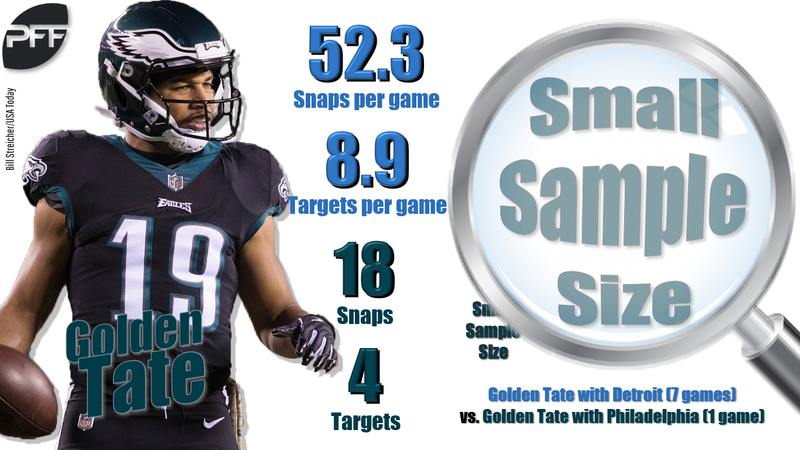 Tate was acquired by the Philadelphia Eagles at the trade deadline, and he had two weeks to prep for the team’s Week 10 matchup against the Cowboys. However, he played just 18 snaps (29%), and while that number is sure to rise in the coming weeks, it wasn’t the start we were hoping for. On the other end of the spectrum, Dalvin Cook is climbing the ranks. He has a tough Week 11 outing (against the Bears), but in Week 9 — still returning from injury — Cook played a team-high (among RBs) 28 snaps. He’s going to be a workhorse down the stretch.